Product prices and availability are accurate as of 2019-04-19 09:44:40 EDT and are subject to change. Any price and availability information displayed on http://www.amazon.com/ at the time of purchase will apply to the purchase of this product. 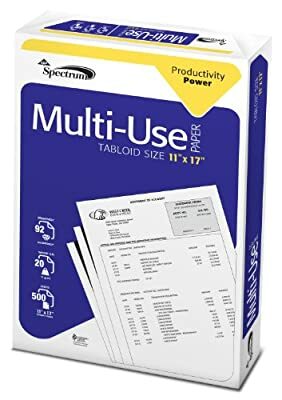 Spectrum Multi-Use, 20 lb paper is designed for copying and printing in a wide variety of imaging devices. This bright white paper is a great all around performer, ideal for everyday communications that include black and white text and graphics. You can expect virtually jam-free performance in copiers, laser and multi-function printers, as well as high-volume printing equipment. For quality, consistency and reliable day-to-day performance, Spectrum Multi-Use is a solid choice.